“I was afraid of that. I kept thinking ‘wow, man, I’m not gonna do too good, because of the weather.’ But it didn’t seem to bother anybody. They were there. For that type of day, I thought we did pretty good,” said promoter Ed Holmes. Fan favorites Chris Golz and Jacob Rodriguez did not disappoint their fervently vocal supporters, claiming victory in their respective matches, both via rear naked choke submission. “I really did think Jacob’s was [fight of the night]. And obviously John Chacon. . . you could see he was probably a great wrestler when he was in high school,” Holmes commented days after the fight. Chacon, in his match against Marc Fusco, scored consecutive takedowns, including a high German suplex, to claim a unanimous decision victory. Blake Webber had an early night, landing a right head kick and punches to finish Fernando Barrera nine seconds into the first round. “You never know what’s going to happen at these shows, you know,” said Holmes. 205+ lbs. (Heavyweight) – Dave Fetherolf (Triple Crown Fighters) def. Cody Smith (Unbreakable Gym) via unanimous decision. 165 lbs. – Blake Webber (Dirty Bird Fight Team) def. Fernando Barrera (Reyes Boxing Club) via TKO, R1, 0:09 sec. 135 lbs. – John Chacon (Millennia MMA) def. Marc Fusco (PKG / Fight Science) via unanimous decision. 185 lbs. – Matt Grigorian (Dirty Bird Fight Team) def. Jesse Crespin (CSW) via unanimous decision. 205+ lbs. (Heavyweight) – Moses Murrietta (Adrenaline MMA) def. Daniel Reynolds (Gauntlet Jiu-Jitsu) via TKO, R3, 0:30 sec. 140 lbs. – Cameron Harris (PKG) def. Jose Huerta (MMAFCd / Champ Krew) via submission, R2, 0:50 sec. 125 lbs. – Ryan Barela (Operation MK Ultra) def. Gabriel Valdez (Blackmat MMA) via unanimous decision. 205+ lbs. (Heavyweight) – Chris Golz (Gauntlet Jiu-Jitsu) def. Daniel Felix (Unbreakable Gym) via submission, R1, 1:23. 135 lbs. – Chris Westrup (Blackmat MMA) def. Anthony Jimenez (Adrenaline MMA) via submission, R3, 1:23 sec. 170 lbs. – Jacob Rodriguez (Academy of Striking and Grappling) def. Eric Steans, Jr. (PKG) via submission, R2, 1:01 sec. “I was really surprised . . . that that many people came out and were happy. Because a lot of these people have been with me for 14 years, and I never heard one person say ‘well, it’s an amateur show.’ I mean they were really excited about it. So I think the amateurs are just as exciting as the pros,” Holmes added. Ka-Boom MMA returns to Quiet Canyon on March 19th, and then to the Westin Bonaventure Hotel in downtown Los Angeles on April 3rd. The first amateur MMA event of 2010 in Northern California took place on January 22nd, as Stand Up Fighters, Inc. promoted “Starting Position,” a 15-match event held at the Sacramento Radisson Hotel. “Everybody was just fired up. . . The crowd was great, the house was packed. All the fighters and coaches were respectful. Probably one of the best events I’ve seen with amateur MMA. These guys were like pros,” commented Stand Up promoter and matchmaker Gary Shurley. The stacked card featured fighters from all throughout Northern and Central California. Fight of the Night honors were given to the sole female match, Brittney Christian vs. Mandy Ybarra, in which Christian edged out Ybarra via split decision. Derek Formoso was anointed Fighter of the Night for his TKO victory, which, ironically enough, was the show’s opening match. For their efforts, Christian and Ybarra were given “Stand Up Fighters” letterman jackets, while Formoso received a championship belt that was designed uniquely for the event. “The girls were the co-main event, and Brittney and Mandy tore it up. . . . [Derek] defended great against the takedown. His leg kicks, his punches, his head movement was crisp,” added Shurley. 145 lbs. – Derek Formoso (Muay Thai Lao Kickboxing Academy) def. Dillon Soper (Marinoble’s Fight Team) via TKO, R2, 0:49 sec. 170 lbs. – Jason Elliot (Valhalla ETC) def. Luke Heebner (Overcome Fight Team) via TKO, R2, 1:47. 125 lbs. – Zach Smith (Ultimate Fitness / Bred 4 Battle) def. Anthony Moser (Brito MMA) via submission (rear naked choke), R3, 1:14 sec. 173 lbs. (catchweight) – Jesse Roberts (Overcome Fight Team) def. Nick Hammond (TNT / Team Takeover) via unanimous decision. 135 lbs. – TJ Dillasahaw (Ultimate Fitness / Bred 4 Battle) def. Kyle Smith (Valhalla ETC) via submission (D’Arce choke), R1, 1:05 sec. 170 lbs. – Ryan Guzman (Huckaba’s Next Generation MMA) def. William Simmons (Brito MMA) via split decision. 160 lbs. (catchweight) – Richard Smith (Ultimate Fitness / Bred 4 Battle) def. Eugene Ivanov (Overcome Fight Team) via submission (rear naked choke), R2, 1:48 sec. 170 lbs. – Jose Quinonez (Cia Paulista) def. Tulio Sara (unlisted) via TKO, R2, 1:51 sec. 145 lbs. – Freddie Patino (Brito MMA) def. Karston Desario (Ultimate Fitness / Bred 4 Battle) via submission (rear naked choke), R3, 1:14 sec. 185 lbs. – Matt Yee (Cia Paulista) def. Steven Murphy (Cen Cal Extreme Fitness) via KO, R2, 0:34 sec. 135 lbs. – Brittany Christian (Overcome MMA) def. Mandy Garcia Ybarra (Fresno Kickboxing Academy) via split decision. 145 lbs. – Jesse Henderson (Huckaba’s Next Generation MMA) def. Morgan Aculdo (Valhalla ETC) via split decision. 165 lbs. (catchweight) – Ray Heredia (Overcome Fight Team) def. Robert Saldivar (unlisted) via TKO, R2, 1:45 sec. 180 lbs. (catchweight) – Alex Ivanov (Overcome Fight Team) def. Jacob Arvance (Fresno Kickboxing Academy) via split decision. Heavyweight – Marty Farmer (Placer County Grapplers) def. David Villescaz (Huckaba’s Next Generation MMA) via TKO, R2, 0:59 sec. For more info on upcoming amateur MMA action, visit http://www.camo-mma.org/events. 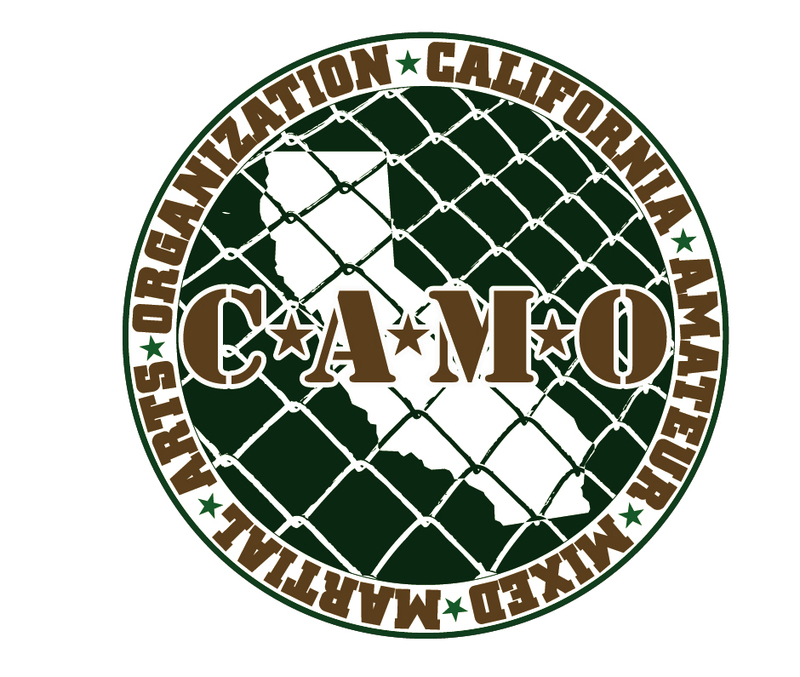 Although November and December typically indicate the end of a calendar year, California Amateur MMA Organization, Inc. (CAMO) was in full swing, as the first three events involving regulated amateur MMA matches in California took place during that time. Promoter Ed Holmes (All-Star Boxing / Ka-Boom MMA Promotions) has the distinction of hosting the first CAMO-regulated match, Jesse Crespin vs. Chris Deroma, which took place on November 20th. This and two other amateur matches made up the amateur portion of a pro-am event at the Quiet Canyon Country Club in Montebello. “It was a great turnout, and at the same time, some of those amateur fights were as good as the pros,” said Holmes. 180 lbs. – Jesse Crespin def. Chris Deroma (Champions Karate Dojo) via TKO, R1, 0:12. 165 lbs. – Jacob Rodriguez (Academy of Striking & Grappling) def. Ruben Gudino (West Coast Fight Academy) via TKO, R1, 0:43. 145 lbs. – Cooper Gibson (Team True Warrior) def. Anthony Jimenez (Adrenaline) via unanimous decision. The first all-amateur CAMO-regulated event took place the following week, November 28th, in Santa Maria, as promoter Jeff Restivo’s California Fight Syndicate presented “Battle at the Barracks,” at the Santa Maria National Guard Armory. “I’m really excited, because it’s a piece of history, and I’ve been wanting this for a long time.” commented CA Fight Syndicate matchmaker Anthony Arria. For Arria, amateur MMA is the crucial stepping stone that aspiring fighters need to prepare themselves and prevent a false-start to their pro careers. “It’s a perfect opportunity for kids to test themselves without getting thrown to the lions. . . With [amateur MMA], now they can let it all hang, and not have to worry about ‘oh, I might not get that big paycheck.’ Unfortunately, that’s what’s happening with pros. You’re getting these guys that are very one-dimensional, and are losing, because they didn’t have an opportunity to fight amateur,” he explained. 155 lbs. – David Snell (SLO Kick Box & Submission Wrestling) def. Alvaro Corral (Paragon MMA) via TKO, R2, 1:46. 162 lbs. (catchweight) – Joseph Fernandez (independent) def. Jason Ordonez (Ventura MMA) via submission, R1, 1:11. 165 lbs. (catchweight) – Eric Prado (independent) def. Josh Passmore (independent) via TKO R3, 0:41. 145 lbs. – Tim Riscen (KnuckleHeadz Boxing) def. Camron Sewel (Paragon MMA) via unanimous decision. 155 lbs. – Joshua Ruehlig (SLO Kickboxing) def. Waldo Dominguez (Team Fresh) via split decision. 160 lbs. – Anthony Dakuras (Santa Maria USA STUD LIFE) def. Vincent Guerrero IV (Blue, Black, & Brown) via TKO, R3, 1:48. 180 lbs. – Michael Perez (KnuckleHeadz Boxing) def. Matt Lovato (independent) via unanimous decision. 163 lbs. 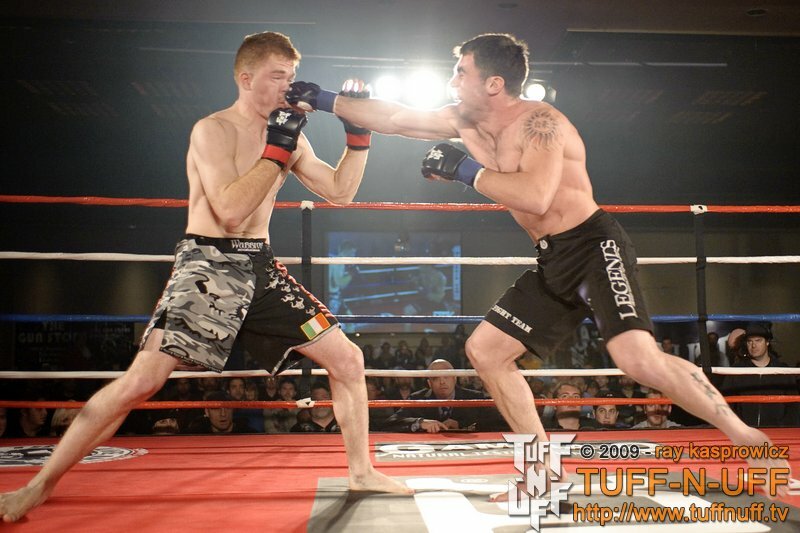 (catchweight) – Michael Gahan (The Pit Fight Team) def. Bren O’Neal (independent) via TKO, R3, 1:04. Heavyweight – Jason Quintero (Paragon MMA / SLO Kickboxing) def. Mike Brown (independent) via submission, R1, 0:39. The final CAMO event of 2009 was “Conquest in the Cage 6,” another All-Star / Ka-Boom semi-pro event, this time at the Westin Bonaventure Hotel in downtown Los Angeles. The event was held on December 5th. 140 lbs. – Jose Medina (Adrenaline) def. Reshan Sabaratnam (PKG) via TKO, R2, 1:46. 185 lbs. – Cody Silvett (Team Wardance) def. Fernando Barrera (Reyes Boxing Club) via split decision. 175 lbs. (catchweight) – Raul Ortiz (Destiny MMA) def. Jesse Crespin (CSW) via TKO, R2, 1:51. 172 lbs. (catchweight) – Lou Tapia (PKG) def. Brandon Weil (independent) via TKO, R2, 1:10. This past weekend, on January 16th, CA Fight Syndicate held their first Pro-Am show. “The show was named ‘Heavy Hitters,’ and at that point it lived up to its reputation,” Arria said afterwards. 193 lbs. (catchweight) – Robert Rud def. Shannon Good (S.B. Fighter / Paragon MMA) via decision. 156 lbs. (catchweight) – Juan Ferrer (SKS) def. Joseph Fernandez (independent) via TKO, R1, 1:56. 155 lbs. (catchweight) – Michael Gahan (The Pit Fight Team) def. Anthony Dakuras (Santa Maria USA STUD LIFE) via TKO, R2, 1:52. 185 lbs. – John Hackleman, Jr. (The Pit Fight Team) def. Sam Vargas (independent) via TKO, R1, 0:22. 286 lbs. – Makani Sarellano (S.K.S. Fight Team) def. Deldridge Jones (independent) via KO, R1, 1:18. 135 lbs. – Brandon Drucker (S.K.S. Fight Team) def. Daniel Garcia (SB Fighter / Violent Tendency MMA) via submission, R1, 1:21. Northern California kicks into gear on January 22nd at the Sacramento Radisson, as Stand Up Fighters Promotions and Coaching Kids MMA present their first event of the year. Visit http://www.CoachingKidsMMA.org for info on tickets. All Star / Ka-Boom returns to the Quiet Canyon Country Club on January 22nd with an all-amateur show, and then to the Westin Bonaventure Hotel on April 3rd. Fight Academy Pasadena presents “Proving Grounds,” a 10-match amateur MMA event, on January 29th, at their gym on 491 S. Arroyo Pkwy. Visit http://www.FightAcademyMMA.com for ticket info. The first CAMO-sanctioned Pankration event takes place on January 30th at the Rollerdome in Thousand Oaks, as T.O. Boxing / Performance Promotions presents “Fight Night 5.” Visit http://www.TOBoxing.net for details. Scottie "Einstein" Epstein will be Chuck Liddell's assistant coach on the next season of "The Ultimate Fighter." 10th Planet instructor / brown belt Scottie “Einstein” Epstein will be Chuck Liddell’s assistant coach on the next season of “The Ultimate Fighter,” which will debut on March 31st and run through June. “This is a great opportunity. . . It makes 10th Planet Jiu-Jitsu go to a whole other level of respect. It legitimizes it more and more,” said Epstein. Season 11 of “TUF” begins shooting this month, and will feature 16 middleweight fighters competing for the traditional “Ultimate Fighter” three-year contract. This will be Liddell’s second tour of coaching duty, as it will be for his opponent, Tito Ortiz. Liddell coached the inaugural season of the show in 2006, against Randy Couture, while Ortiz coached season three, against Ken Shamrock. Although the announcement that Liddell and Ortiz would coach season 11 and subsequently face each other in a third match was met by many MMA fans with anti-climactic disappointment, Epstein is one of the vocal enthusiasts for the match, believing that this will be the opportunity for Liddell to reinvent himself as a ground specialist. 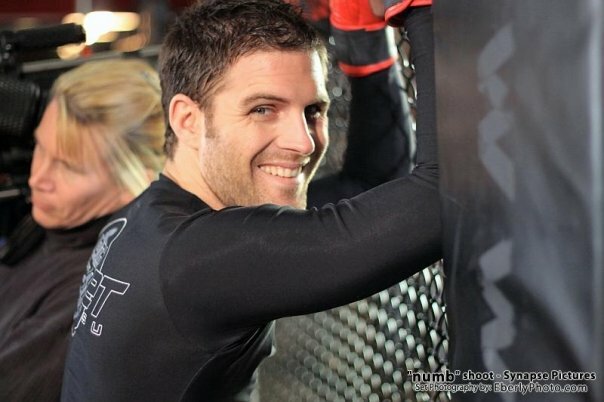 This will be the second 10th Planet / Legends MMA member to coach on “The Ultimate Fighter,” as Chris Reilly served as striking coach for Team Rampage on season seven (Quinton Jackson vs. Forrest Griffin). Best of luck to Einstein and Team Liddell.